WASHINGTON, D.C. – From its warmongering in Iraq, Syria, and to a degree in Yemen, to its meddling in Lebanon, Bahrain, Saudi Arabia, the Palestinian territories, and Turkey, the Iranian regime and its Islamic Revolutionary Guard Corps (IRGC), through its terrorist proxy in Lebanon, Hezbollah, have caused chaos in the Middle East region since it came to power in 1979. The following is a list of Iran-sponsored terrorist activities that have taken place since Iran’s late Shah Mohammad Reza Pahlavi was overthrown and replaced with radical Islamic hardliner Ayatollah Ruhollah Khomeini. 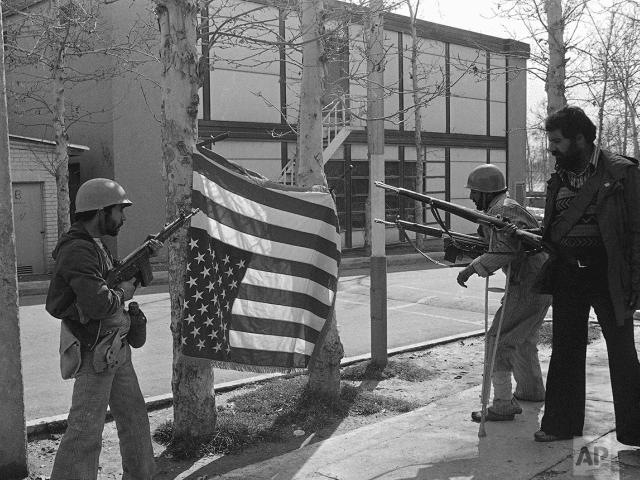 1979: 52 American diplomats and citizens were taken from the U.S. Embassy in Tehran and held hostage for 444 days between November 4, 1979 – January 20, 1981 by a group of Iranian students belonging to the Muslim Student Followers of the Imam’s Line, supporters of the Iranian Revolution, and with the help of Iran’s Islamic Revolutionary Guards. 1982: Between 1982 and 1992, Iran-backed Hezbollah systematically abducted a total of 96 foreign nationals, including 25 U.S. citizens, during the Lebanon Hostage Crisis. CIA Station Chief William Buckley was among the Americans killed. 1983: On April 18, 1983, an Iran-backed Hezbollah suicide bomber rammed a truck into the U.S. embassy in Beirut, Lebanon, killing 63 people, including 17 Americans. 1983: On October 23, 1983, Iran-backed Hezbollah killed 241 Americans in a terrorist attack on the U.S. Embassy’s Marine barracks in Beirut, Lebanon. Over 100 were wounded. The explosion caused what was described as the “largest non-nuclear explosion that had ever been detonated on the face of the Earth,” A separate, and simultaneous, suicide truck bombed and destroyed a building housing French soldiers, leaving 58 French paratroopers dead. 1983: On December 12, 1983, Iran-backed Hezbollah and Iran-backed Shiite group Da’wa bombed the U.S. embassy in Kuwait leaving six dead and ninety injured. 1984: On September 20, 1984, Iran-backed Hezbollah detonated a van carrying explosives outside the U.S. Embassy annex in East Beirut, Lebanon, leaving 24 people dead. Among them were two Americans. 1985: On Friday, June 14, Iran-backed Hezbollah hijacked TWA flight 847, flying from Cairo, Egypt, to San Diego, California, and dumped U.S. Navy Diver Robert Stethem’s lifeless body onto the runway at the Beirut Airport. The hijackers sought the release of 700 Shi’ite Muslims being held as prisoners in Israel, Kuwait, and Spain. 1987: Hezbollah al-Hejaz, the Saudi-backed branch of Hezbollah, together with the help of the IRGC, carried out two attacks between 1987 and 1988. First, they bombed a gas facility in Ras al-Juaymah, Saudi Arabia, in August 1987. Then, in March 1988, they bombed a petrochemical plant in Jubail and an oil refinery in the Saudi City of Ras Tanura. 1988: United Nations Diplomat Robert Higgins was kidnapped in South Lebanon. Although the exact date of his murder is uncertain, he was declared dead on July 6, 1990. 1989: On July 13, 1989, then Secretary-General of the Kurdish Democratic Party of Iran (KDPI) Dr. Abdul-Rahman Ghassemlou was murdered in Vienna, Austria along with two of his associates where he was meeting secretly with Iran’s then-President Hashemi Rafsanjani. Austrian sources have reportedly connected Dr. Ghassemlou’s assassination to former Iranian President Mahmoud Ahmadinejad through the sale of weapons. 1991: On August 8, 1991, Iranian politician Shapour Bakhtiar, the last Iranian prime minister prior to the Islamic Revolution of 1979, was murdered by Islamic regime operatives. 1992: On March 17, 1992, Iran-backed Hezbollah carried out a suicide bombing on the Israeli embassy in Buenos Aires, Argentina, leaving 29 people killed and injuring 242 others. 1992: On September 17, 1992, the Iranian regime and then-Minister of Intelligence Ali Fallahian executed the murder of four Iranian Kurds at the Mykonos Café in Greece. The murder also included Dr. Mohammad Sadegh Sharafkandi, then-leader of the KDPI. 1994: On July 18, 1994, the Iranian regime bombed the AMIA Jewish community center in Buenos Aires, Argentina, leaving 85 people dead and injuring 300 others. This attack was the deadliest in the history of the Western Hemisphere prior to September 11, 2001. 1996: On June 25, 1996, fourteen members of the Iran-backed Saudi branch of Hezbollah bombed the Khobar Towers in Saudi Arabia, leaving 19 U.S. airmen dead and 372 injured. 2000: On October 7, 2000, Iran-backed Hezbollah forces abducted three Israeli Defense Forces (IDF) soldiers from the Israeli side of the border with Lebanon. Benny Avraham, Adi Avitan, and Omar Souad’s bodies were returned to Israel in 2004 in exchange for the release of 400 Palestinian prisoners. 2005: On February 14, 2005, Iran-backed Hezbollah assassinated Lebanese Prime Minister Rafic Hariri, along with 21 others, in an explosion in Beirut. 2006: On July 12, 2006, Iran-backed Hezbollah infiltrated Israel in a raid, killing seven IDF soldiers in a conflict that would continue for a month. 2007: In March 2007, the Asaib Ahl al-Haq (AAH) terrorist group, directed by the IRGC-Quds Force, oversaw an attack that killed five U.S. soldiers in Karbala. The group’s leader, Sheikh Qais al-Khazali, directed this attack. 2007: Sheikh Qais al-Khazali organized the kidnapping of five British men in Iraq. 2009: Certain paramilitary groups in Iraq are affiliated with the IRGC and are engaged in terrorism and crimes against humanity. On June 24, 2009, the State Department designated Kataib Hezbollah (KH), a paramilitary group in Iraq affiliated with the IRGC, a terrorist organization. The group was responsible for attacks on U.S. forces, including the bombing of a U.S. Embassy in Iraq. The group’s head currently reports directly to Quds Force Commander Qasem Soleimani. 2011: In October 2011, dual U.S.-Iranian citizen Mansoor Arbabsiar and IRGC-Quds Forces commander Gholam Shakuri planned to bomb a restaurant in Washington, D.C., in order to target then Saudi Ambassador to Washington, Adel al-Jubeir. The plan was thwarted. 2012: Between February 13 and 14, 2012, members of the IRGC attempted to assassinate the wife of an Israeli diplomat in New Delhi, India. The wife and her driver were injured after the device planted on their car detonated. 2012: In March 2012, IRGC-backed terrorists targeted U.S. and Israeli officials in an Azerbaijan-based terror plot. Arrests prevented the plots from being carried out. 2012: On July 18, 2012, Iran-backed Hezbollah bombed a bus in Bulgaria, killing five Israeli tourists and the bus driver and injuring more than 30 others. 2015: In August 2015, Kuwait foiled an Iran-backed Hezbollah terror plot meant to destabilize Kuwait, which is located to the southeast of Iraq, where Tehran has a heavy presence. 2015: In December 2015, members of Iran-backed Katai’b Hezbollah in Iraq kidnapped 29 Qatari falcon hunters in the Iraqi desert only to release them over a year later in exchange for hundreds of millions of dollars in ransom. Since then, nearly a dozen planned terrorist attacks by Iran-backed Hezbollah have been thwarted. The IRGC could be designated a terrorist organization under Executive Order 13224, first signed by President George W. Bush on September 23, 2001. In February, the National Council of Resistance of Iran (NCRI)—an exiled Iranian resistance group affiliated with the Mujahedin-e-Khalq (MEK)—published a detailed intelligence report specifying the scope of terrorist training camps run by the IRGC and Quds Forces within Iran for the specific purpose of training foreign mercenaries. The report showed how the IRGC poaches Afghani and Pakistani recruits and brings them to Syria and Iraq to carry out the Iranian regime’s dirty work. “Every month, hundreds of forces from Iraq, Syria, Yemen, Afghanistan, and Lebanon—countries where the regime is involved in frontline combat—receive military training and are subsequently dispatched to wage terrorism and war,” the report states. The IRGC reportedly also recruits people from Shiite-majority but Sunni-governed Bahrain. Some analysts have argued that declaring the IRGC as such would result in retaliation and endanger U.S. personnel in the region. Others have suggested designating the IRGC would undermine the fight against the Islamic State (ISIS, ISIL, Daesh). However, it is critical to note that the IRGC has helped prop the Islamic State they now fight up through the promotion of their puppet governments in Syria and Iraq, both of which are essentially under Tehran’s control.